Another cracking day of bowls with the spectators on the edge of their seats! 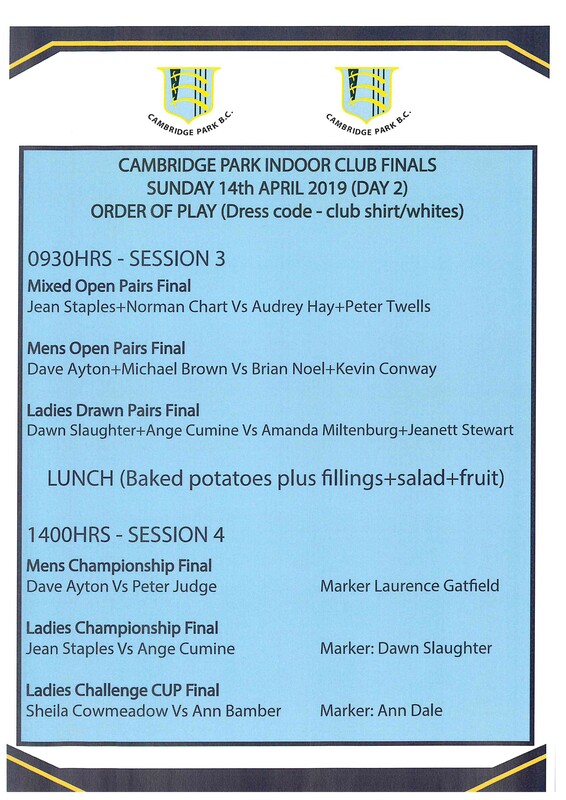 Ladies’ Drawn Pairs – Amanda Miltenburg & Jeanett Stewart – on the extra end! Ladies’ Singles – Ange Cumine – on her first go in the championships! It was pretty much nip and tuck all the way. Thanks to Ange for preparing the jacket potatoes and chilli and grating all that cheese; to Ann D & Laurence for getting everything heated up in time for when the players finished their morning matches; to everyone who helped behind the bar; to Ann B, Barbara and Dawn for the cakes; and yet again the number of spectators who chipped in and washed up, cleared up and put everything away while we were on the green. Also a big thank you to Ron Eden, the umpire for the day. That concludes the indoor season for 2018-19 as the changing rooms have now been emptied and the men have been in already to take all the old lockers away and start work on prepping, decorating and installing new lockers.